Great attention to detail and authenticity has been paid in the selecting and hand making of the military swords and sabres offered by Access Heritage Inc (formerly known as The Discriminating General). As you will see, the following hand forged, battle-ready replica swords are not only rare, and beautifully constructed, but also affordably priced to be attainable to the most selective collector or re-enactor. Each sword blade is made of superior AISI 1055 high carbon steel and are evenly tempered/hardened and well balanced. Sword of the Mousquetaries of Louis XV and Louis XVI. A dazzling looking 18th century sword. This pattern was introduced to the Musketeer Cavalry companies in 1759 and continued in production to 1776 so was being used at the time of the American Revolution. The 1st Company received brass hilts and scabbards while the 2nd company received white metal swords. Obviously this is a reproduction of the 2nd Company's sword. The hatchet-tipped blade of this sword is made of 1055 high carbon steel and hand finished. This sword is based on an original in the Musee d'armee in Paris. Grenadier a Cheval de la Garde Sword This powerful yet elegant sword was used by the Horse Grenadiers of Napoleon`s Imperial Guard. As the pictures attest, this reproduction is true to the original, capturing the French ability to design a heavy cavalry sword that has strength but with the minimum sacrifice in sword balance and mobility. French Artillery Officer Sword This pattern of sword was used by both Napoleon's Artillery officers and those of the Artillery Train. As with all our other swords, this pattern is based on original examples and is made with high carbon "spring" steel blades possessing a thick continuous tang. Since Napoleon relied heavily on the artillery in weakening the enemy's line before attacking in column, this sword is a wonderful collectable for telling the story of the French Army in that period. Napoleonic AN XII Dragoon Sword Introduced in 1805, this sword replaced the less attractive AN IV Dragoon sword with its flat hilt design. The four-bar brass hilt adopted at this time was the same as the Cuirassier. This replica has a black grip with a brass ferrule. The wooden scabbard, wrapped with leather and mounted with brass hardware with ball at the end of the chape was typical of the Dragoons. The blade is high carbon spring steel and well fulled like that of the originals. In addition the back of the blade is etched with arsenal markings and there are also inspector markings stamped on both the blade and the hilt as per the originals. Imperial Guard Light Cavalry Trooper's Sabre This sabre was first issued in 1803 to Napoleon's "enfants cheris" (cherished children): the famous Chasseur a Cheval de la Garde. 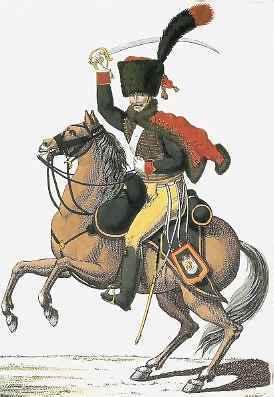 Where Napoleon went so did his Chasseur a Cheval de la Garde. From Austerlitz to Waterloo, Napoleon's cherished children fought hard for their emperor. In addition some Hussar Regiments carried a very similar sabre but with minor variations in the scabbard. With its brass "D" shaped hilt, 33 1/2 inch blade, and beautifully constructed leather, wood and brass scabbard, this is truly a beautiful sabre and worthy of its popularity. The back of the blade is engraved with the "Mfture Nale de Klingenthal Coulaux frères Entreps" The inspector's stamps on this particular reproduction are the "LW" of Directeur Levavsseur and the "M" under a circle/star of Controleur 1re Classe Jean-Jacques Mouton. The scabbard itself has reinforced suspension rings for increased strength. Historically the wood interior also aided in keeping the sabre sharp by avoiding metal to metal contact while drawing and sheathing it. Finally the blade itself is made of high carbon steel and has good balance to it. French Infantry Soldier's Sword (1754-63). After attending numerous reenactments and listening to French reenactors express their concerns over the lack of an affordable Epee du Soldat, we decided to do something about it. We are now offering a replica which is quite similar to the quality and appearance to other more expensive replicas of this sword on the market, however at virtually half the price. The photos will testify to its similar quality. This sword has a high carbon steel blade, brass hilt and black leather wrapped wooden scabbard. Cuirassier Trooper's Sword. Any scholar of Napoleon's army would be impressed at the weight and presence of this sizable sword with its 37 1/2" blade. This hilt comes with a leather and wire wrapped grip. The grip is brown leather (both black and brown were used). The grip is without a ferrule or lower ring. Numerous originals do not have a ferrule but instead have more wraps of wire, especially ones made during the post-Russia campaign period that this sword represents. The blade is high carbon spring steel and well fulled like that of the originals. In addition the back of the blade is etched the date and what arsenal is was made for: "Manufacture Imperial du Klingenthal Octobre 1813". Again with attention to detail, there is (a) the armoury 1st Class inspector's mark for 1812 (laurelled "B" for Jean-George Bick); (b) the proofer's marking ( "L" for Francois Louis Lobstein); and (c) rack numbers. The last element is particularly interesting because every sword has a different number therefore your sword will not be like any other. Comes complete with two-ringed steel scabbard. There is even a Bick' s "B" stamped on the top of the mouth of the scabbard. Incredible! Historical Fact: This sword found its way into the hand of Lt. Colonel Frederick Gustavus Skinner during the American Civil War. His desire to put his blade to good use at the Battle of Manassas in Virginia, makes a fascinating footnote to the history of this sword. Read more about Skinner by clicking here. ANXI Light Cavalry Trooper's Sabre. Used by Napoleon's famous hussars, chasseurs, and horse artillery, originals of this sword are well-sought-after in collector circles. This is an exceptionally will executed piece and could be easily mistaken as an original. The three bar guard flows well into the rest of the hilt. The pommel/ back strap piece has a slight tilt forward complete the hilt's elegant presence. One unique elements of this sabre is the leather wrapped, ribbed grip with its brass centre stud. As with many of our other swords, the arsenal markings (dated Octobre 1811) are on the back of the slightly fulled 33 1/2 inch blade. With attention to detail, all the maker and inspector marks have been painstakingly added to the blade just below the hilt. Completing this famous sword is its two-ringed steel scabbard. A must for any sword collector. Heavy Cavalry Sword. Carried by regiments such as the Grenadier à cheval de la Garde (Imperial Guard) this example is the finest and most complex sword in our collection. Its massive engraved brass hilt with mounted grenade and wire wrapped leather grip is elegantly crafted. Particularly note the slightly forward slope of the pommel and grip. The high carbonized steel 37 1/2 inch blade is well fulled like that of the originals. The scabbard is most remarkable. It is made of brass with a leather insert and has two brass. French Cavalry Officer's Sabre (AN XI). We placed this model of sword in our Napoleonic swords because it is often passed off as an original Hussar officer's AN XI sabre at auctions. It is in fact the present pattern (F1) of French Light Cavalry sabre, which is a copy of an AN XI pattern Napoleonic sabre given to General De Gaulle in 1942. While it lacks the historic stampings and markings, it is quite an elegant sword and has proved itself to be a decent enough copy to fool many an auction buyer. The sword itself is elegantly crafted and detailed as the images attest. The balance and construction of the 32-inch high carbon steel blade is superb. Lastly is its attractive price. French Infantry Sabre Briquet. This is the requisite for the French Napoleonic enthusiast. Carried by most of Napoleon's infantry throughout the height of the Empire, it will be a great addition to your collection. What makes our replica so good is the attention to detail. The 23 1/2 inch blade is of high carbon steel. This pattern of sword is very popular with Champagne Opening Societies, and we have supplied them to members in both Europe and North America. This version now comes with the stud attachment mounting. This sword is truly a fine piece at an amazing price. French Officer's Epee or Straight Sword. The sword pattern we offer is but one a many different variations on the officer's epée. Indeed it was probably the most personalized items of every officer's wardrobe. This sword was commonly worn by Napoleon's cavalry and infantry during social functions while dress in their social attire (tenue de societé). But this sword's use did not end there. For many an infantry officer, this was also their side arm of choice in the field. Indeed it probably a frequent use in the famous duels between fellow officers. The hilt of this pattern has a knight's helmet pommel, silver wire wrapped grip, and smooth brass guard, sleeve, quillons, and shell guard. The 32 1/4 inch blade is particularly elegant with fine, historically correct engraving. Completely this sword is its handcrafted leather scabbard with a brass locket with frog stud and chape or end piece. We expect this to be a very popular sword. AN IV Dragoon Sword. Introduced near the beginning of the republic (1794), this pattern of Dragoon sword was manufactured with both iron and brass hilts (some English uniform historians have improperly interpreted the hilt as copper because of the use of the French word "cuivre" - this word is used to mean brass as well and is supported by original examples). This pattern continued to be used and manufactured throughout the First Empire, even with the introduction of the AN IX, AN XI, and AN XII patterns. This reproduction is a beautifully executed piece with its unique cut brass and leather-wrapped wood scabbard complete with the ball-end chape (brass piece at the point of the scabbard). The 37 inch blade is well fulled and with Klingenthal arsenal markings on its back. With a black leather grip wrapped with brass wire, with sword will make an excellent addition to your collection. An IX Light Cavalry (Hussar) Officer's Sabre. Introduced in 1802, original examples of this sword show a number of variations in the blade etching and scabbard hardware. For example, an original for the L'artillerie a cheval de la Garde in the Musee de l'Armee shows crossed cannons on the brass pieces on the steel scabbard. Another example for an etat-major has fine bluing and gilding on the blade etching. One Chasseur a cheval officer had the brass bars of the hilt etched with scales (blade etching same as the reproduction offered here). As you will see from the illustrations this reproduction is of superior quality. The beautifully-crafted 33 1/2 inch blade alone is worth the acquisition. The steel scabbard with brass mountings is unique to this item. The blade arsenal markings are "Manufacture Imperial du Klingenthal Dec 1812". The brass back strap and pommel slope nicely forward and the black leather grip is mounted with twisted brass wire. The pictures speak for themselves. 1st Empire Sapeur's Sword. Sapeurs in the Napoleon's Army, marching in front of their with their broad-bladed axes and bearskins and bearded faces, made a significant impression of an onlooker. An important part of this look was the Sapeur's sword. The one offered here is the model adopted after Napoleon crowned himself Emperor. This is evident with the eagle-headed pommel and grip along with lion's head details in the centre of the Cross-piece and at its ends or the Quillons. Even the scabbard belt stud is the face of a lion! The tempered blade is 29" long with an 18 inches sawback section along with engraved Arsenal markings and fulling. The scabbard is leather with brass throat and chape. Judge for yourself on how nice the sword is. Infantry Officer's Sabre. This sword was carried by officers serving in the Grenadier, Voltigeur, Carabinier and Chasseur companies of Napoleon's infantry. While they varied somewhat in pattern, this particular example is one of the more elegant. Below are three images of this sword. Note the properly engraved blade with laurels and trophies, the ebony-like grip, and the finely caste pommel and D-guard. Even the scabbard shows attention to detail with tooling marks on the leather, and engraved lines on the brass mountings. *$US prices for US and International residents. Canadian residents are charged in Canadian Dollars with GST/HST Taxes.